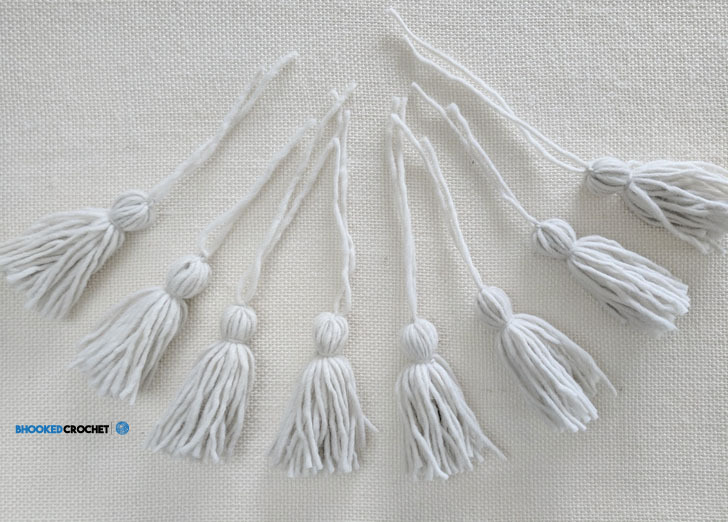 How to Make Tassels? It’s Easy! I couldn’t help but join this party. If you’re anything like me, you have yarn scraps in all nooks and crannies of your home that you didn’t have the heart to throw away when you finished your project. Finding creative ways to use pompoms and tassels have given these lost little scraps a new purpose in life! After teaching you how to make tassels this week, I’ll be sharing a festive way to use them this Halloween!! I’ll have that one ready for you on October 29th. Tassels – Maker or no maker? You may have seen the tassel makers available from Boye and Clover. I’ll be honest, these tools are not in my personal collection. It took me a while to adopt the pompom maker but once I did, man did life get a little cleaner and my pompoms a lot rounder. I’m sure this is also the case for tassel makers but for now, I’ll stick to making them by hand. If making them by hand isn’t your jam, I’ll link to Boye and Clover’s tassel makers below. Cardboard, crochet hook case, coaster or Post-It notes! In the absence of a tassel maker, we need to get a little creative to find a structure to hold the yarn as we make the tassel. I have used Post-It notes in the past, a scrap piece of cardboard box, coasters and even a crochet hook case, which I’ll be using in the tutorial. 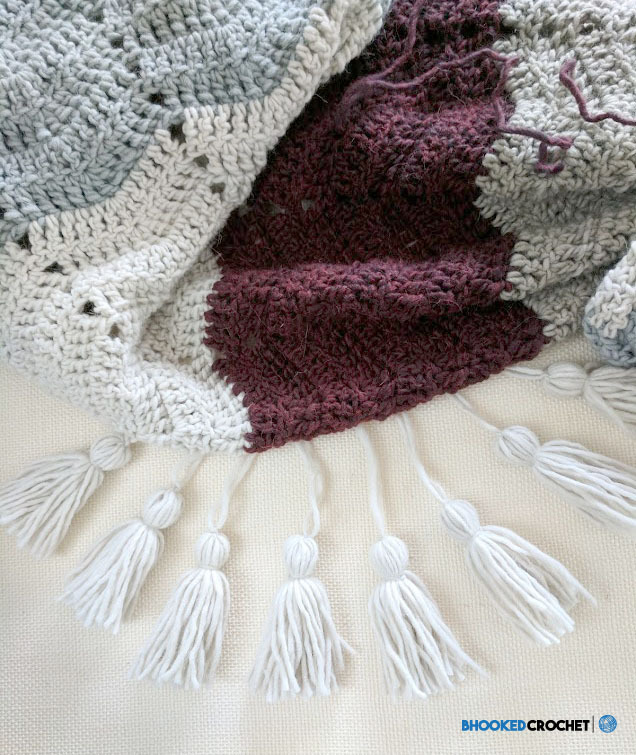 The idea is to have something rigid to wrap your yarn around so your tassel is uniform. The height of your “structure” is how long your tassel will be. Once you have this piece of the puzzle, making a tassel by hand is really quite simple. As you can see, making a tassel by hand is really quite simple. 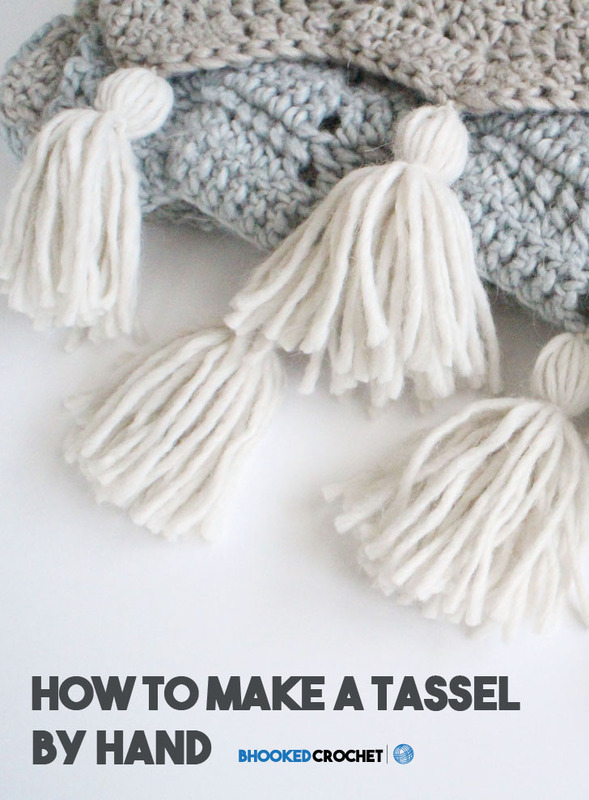 I’m sure I will eventually cave and buy a tassel maker but for now, I’m happy to share this quick little tutorial with you. I would love to see the clever ways you use these tassels! 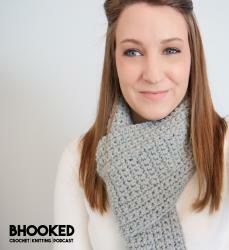 Be sure to use the Craft Yarn Council’s hashtag, #pompomparty to share your inspiration with us!